Happy Birthday Rhogam! You’re 45 years young and still going strong. You have never been the media darling de jour making headlines causing controversy and brouhaha. In fact, you don’t get any media attention, and you should. You have saved countless lives in that time working tirelessly and quietly. You are truly one of the great advances of modern medicine. What makes Rhogam so great is that it has saved thousands and thousands of newborns since it was implemented in 1969. We all are born with a blood type-A, B, AB, or O. We are also given a Rhesus status either Rh positive or negative. The majority of us are Rh positive, at least 85% of us. That means 15% are Rh negative. If a pregnant woman is Rh negative, she has a good chance of having a baby who is Rh positive. If an Rh negative woman is exposed to Rh positive blood she can make antibodies to Rh positive blood. Those antibodies are very small and can cross the placenta and destroy the baby’s blood. The baby becomes very anemic and thus becomes very sick or could die. Of course, the question begs to ask, how does an Rh negative woman become exposed to Rh positive blood? She does so through pregnancy. 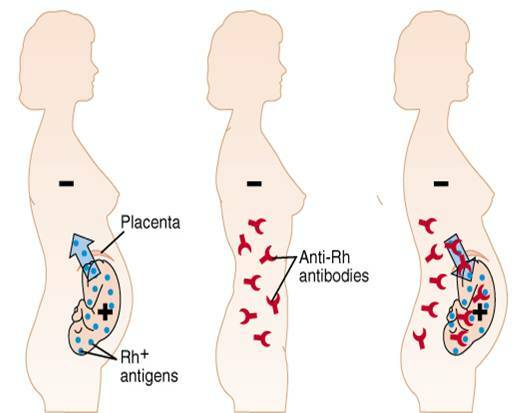 The first Rh positive pregnancy can expose her, creating antibodies that attack any future exposures. Prior to 1969, many Rh negative women had 1 or 2 babies that were healthy, but any babies after that frequently had hemolytic disease of the newborn (HDN). HDN has a 50% death rate. Prior to Rhogam’s birth, 10,000 babies died each year from HDN in this country. Rhogam is a shot given to Rh negative women during pregnancy at 28 weeks, with any bleeding in pregnancy, after CVS/Amniocentesis, miscarriage, threatened miscarriage, ectopic pregnancy, blunt trauma, or after delivery of an Rh positive baby. It is very important to get this shot if any of these events occur. Once the antibodies are formed, the Rhogam shot will not work. Rhogam prevents our bodies from making antibodies, and must be given each time we are exposed to Rh positive blood. What exactly is Rhogam? It comes from pooled plasma sources which have high antibody titers to Rh(D) positive erythrocytes (red blood cells). The plasma is tested for and negative for HIV, parvovirus, and hepatitis. Furthermore, the process to make the Rhogam immune globulin also destroys virus particles. Rhogam is NOT blood but an immune globulin. This makes it a very safe product to receive. Currently, there is no synthetic product available. antibodies to Rh positive blood. There are many theories out there. What I tell my patients is that Rhogam is like the cloaking device on Star Trek’s ship the Enterprise. Capt James T. Kirk employs the cloaking device to make the Enterprise invisible to the Klingons. The Klingons can’t attack what they can’t see. Future wars with the Klingons are thus avoided. As the Enterprise leaves Klingon space, the cloaking device is no longer needed. Rhogam cloaks the Rh positive blood in the system of the Rh negative woman making it invisible. Her Rh negative blood can’t make antibodies to the Rh positive blood. The Rh positive blood eventually leaves her system and it is like she has never been exposed. Rhogam works and works well. If you are Rh negative and pregnant, get your Rhogam shot when recommended. If you have any questions about Rhogam, your doctor or nurse can answer any questions you have.